Most years, the Draconids produce a big bag of nothing. At most a meteor or two all night but certainly nothing worth marking your calendar for. But 2018 could be different as this short-lived shower peaks after sunset on October 8. The Draconids are a class III variable shower. For comparison, the Perseids in August and Geminids in December are Class I major showers. Far more reliable and producing around 100 visible meteors per hour under best conditions. 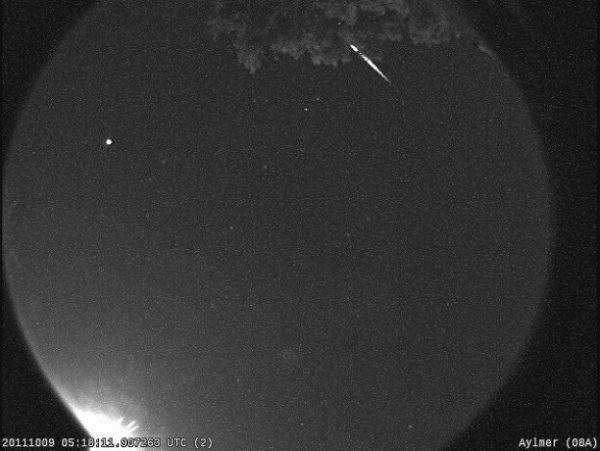 But variable meteor showers aren’t all bad, they’ve got two things going for them. 1) they are best seen during the evening hours, unlike other showers that are best viewed pre-dawn and 2) occasionally they deliver outbursts of meteors. Like other meteor showers, the Draconids are produced as Earth passes through the trail of debris left by comet21P/Giacobini-Zinner. Debris is released as the sun heats the icy surface of the comet’s boiling off that ice and ejecting dust and bits of rock with it. This happens all along the comet’s orbit but especially as it gets closer to the Sun, and that’s just what happened last month. Comet Giacobini reaches perihelion or the closest point in its orbit to the sun last month. Seven days later, its orbit path crossed Earth’s orbital path. Previous outbursts have occurred in years like this. The Draconids produced two of the most impressive displays of the last century in 1933 and 1946 with hundreds of visible meteors per hour. In 2011, observers in Europe reported over 600 per hour and radar detecting more than 1000 more per hour. Earth also passed through the comet’s trail shortly after it had passed in 1952 and 1972 raising hopes for a brilliant display which produced that same big bag of nothing. What will 2018’s Draconids be like? The answer is waiting for you outside.